The most important thing I want my children to feel and think about at Christmas time is love. We celebrate Christmas because of Jesus' love for us, and because of God's love for us. Jesus was our best example and He showed us love time and time again. Finding opportunities to serve at Christmas is an excellent way to help your family to feel love and to experience the joy of serving others. 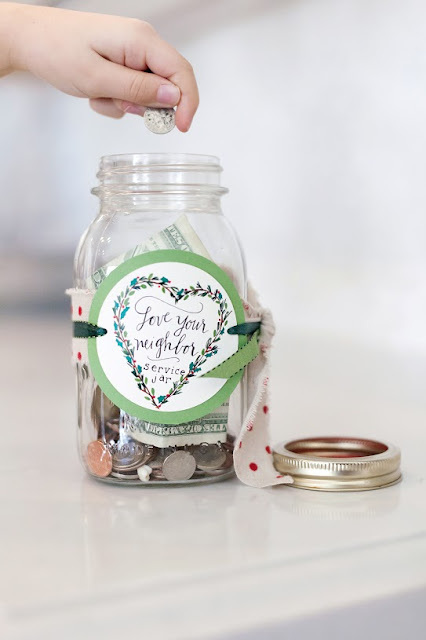 - An Activity: Make a "service jar" with the free printable label included. You can make a goal to save money throughout the year, to put towards providing Christmas for another family in need next year! (You could also use this idea sooner than Christmas if you're able to save up enough to provide service in other ways throughout the year).